One of the most beloved snacks are potato chips. Unfortunately, they’re dangerous. As Pringles once said- one you pop you can’t stop. Chips really have no nutritional content and therefore they don’t make the best every day snack. Seeds, on the other hand, make a wonderful nutritious snack. 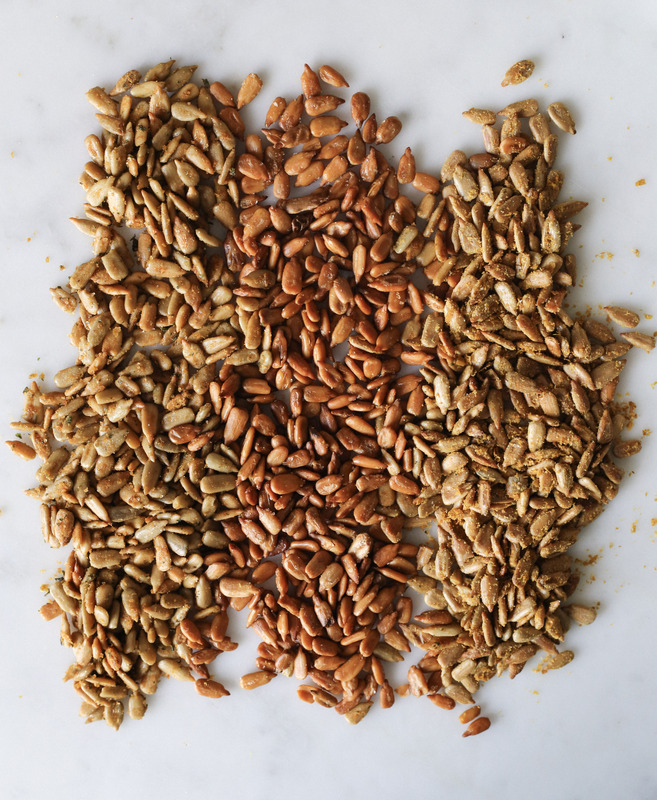 Sunflower seeds are worth daydreaming of, they just need to be roasted with the right seasonings. In this recipe I paired delicious chip flavours- Ranch, Salt & Vinegar, and Cheddar with sunflower seeds, resulting in your favourite snack reimagined. Okay, cheddar may not be a popular chip flavour but it should be. Get ready to lick your fingers clean! Preheat oven to 350°. Line a baking tray with parchment paper. In a small bowl whisk together all of the ranch seasoning. In a larger bowl stir together the seeds, olive oil, and seasoning, until seeds are evenly coated. Spread the mixture in a single layer on prepared baking tray and roast for 15 minutes or until golden, stirring halfway through. Allow to cool entirely before enjoying. Soak the seeds in vinegar for at least one hour, occasionally stirring the seeds, once or twice. Before roasting, preheat oven to 350°. Line a baking tray with parchment paper. Drain off excess vinegar from the sunflower seeds. Spread the mixture in a single layer on prepared baking sheet and sprinkle with sea salt. Roast for 30 minutes or until golden, stirring halfway through. Allow to cool entirely before enjoying. In a medium bowl stir together the seeds, olive oil, nutritional yeast, salt, and smoked paprika (if using) until seeds are evenly coated. Spread the mixture in a single layer on prepared baking tray and roast for 15 minutes or until golden, stirring halfway through. Allow to cool entirely before enjoying. This entry was posted in Snacks and tagged DIY, dried herbs, easy, nutritional yeast, plant food, seeds, snacks, spices, sunflower seeds, Vegan. Bookmark the permalink.